At last marketing managers and business executives concerned with profitability and sustained growth of their organisation have at their fingertips a practical guide which tells them how to prepare and use a marketing plan. In this new edition of Marketing Plans, one of the world's leading marketing educators has greatly expanded his book to include the key recent developments in marketing techniques and a range of practical marketing tools. In Marketing Plans, the whole process of marketing planning - from initial assessment of a company's business plan to the steps necessary to ensure a company achieves its profit targets - is fully explained. There is an additional section which provides a step-by-step 'this is how you do it' guide to devising your own marketing plan, combining the very best of current practice with the necessary theoretical background. Marketers, executives and students studying for CIM and CAM exams will find the application of basic marketing principles to sound business practice invaluable. For tutors, there is a comprehensive resource pack containing OHP masters, chapter-by-chapter tutor notes, examples of real marketing plans, case studies for classroom use and interactive exercises on floppy disks. 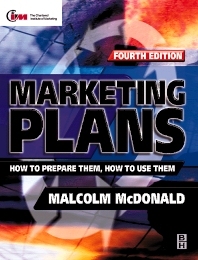 Understanding the marketing process; The marketing planning process: the main steps; The marketing planning process: removing the myths; Completing the marketing audit: the customer and market audit; Completing the marketing audit: the product audit; Setting marketing objectives and strategies; The communication plan: the advertising and sales promotion plans; The communication plan: the sales plan; The pricing plan; Marketing information, forecasting and organizing for marketing planning; Implementation issues in marketing planning; A step-by-step marketing planning system. MA(Oxon), MSc, PhD, D.Litt. FCIM FRSA, until recently was Professor of Marketing and Deputy Director Cranfield School of Management, with special responsibility for E-business. Malcolm is a graduate in English Language and Literature from Oxford University, in Business Studies from Bradford University Management Centre, and has a PhD from Cranfield University. He also has an Honorary Doctorate from Bradford University. Malcolm has extensive industrial experience, including a number of years as Marketing Director of Canada Dry.